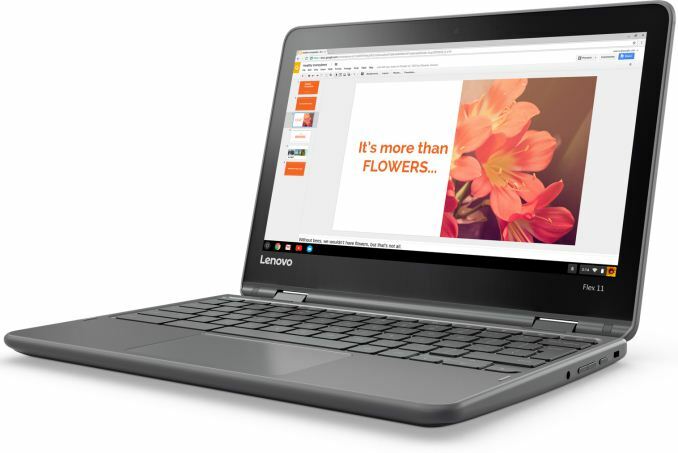 Lenovo has announced its first 2-in-1 Chromebook designed specifically for consumers. The Flex 11 laptop is powered by an SoC with four ARM cores, features a 360° hinge, a battery that can last for 10 hours and an anti-spill keyboard, a rare feature on inexpensive PCs. The computer will initially ship without the Google Play Store, but the manufacturer promises that Android apps will be coming to the Flex 11 “soon.” Lenovo plans to start selling the new notebook already this month for a price below $300. Lenovo was not among the first wave Chromebook manufacturers back in 2011, but released its first laptop running Google’s Chrome OS nearly two years later. Since then the company has been gradually expanding its lineup of Chromebooks targeting different audiences. At first, Lenovo only aimed its ThinkPad X131e Chromebook at students in 2013, then it moved on to business users with the ThinkPad Chromebook 13 in mid-2016. Such approach is perfectly logical because students and road warriors use a relatively limited set of applications. With the Flex 11, the company finally releases a Chrome OS-based computer for general consumers, whose needs are very diverse. 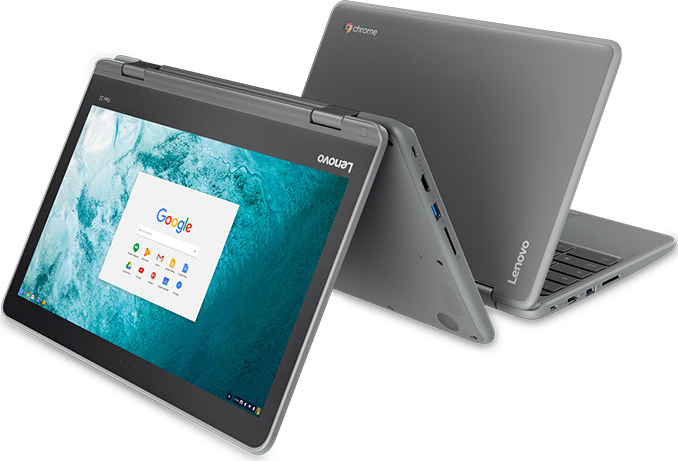 One of the reasons why Lenovo can target wide audiences with its Chromebooks is because the Chrome OS now supports Android apps and end users can use a wide range of programs they might need. Keep in mind though that there are not a lot of Android applications developed specifically for tablets or 2-in-1s. Since the Lenovo Flex 11 Chromebook was designed with Android software in mind, it is not surprising that the manufacturer decided to go with the 2-in-1 form-factor and an 11.6” touchscreen display with a 1366×768 resolution. The 360° hinge of the Flex 11 supports four dynamic modes (watch, tent, laptop, and tablet) to better handle different activities. Lenovo claims that the Flex 11 comes in a drop-resistant enclosure made of plastic with an anti-spill keyboard (can handle up to 330 ml of liquid) and “reinforced” ports (whatever that means). The rugged casing made of thick plastic affected dimensions and weight of the Flex 11: it is 21.2 mm thick and weighs 1.35 kilograms, which means that Lenovo traded portability for lower weight, which is logical as the 2-in-1 has a tablet mode (the lower the better). When it comes to the CPU, the Lenovo Flex 11 is based on an SoC featuring four ARM cores running at 2.1 GHz. The manufacturer does not elaborate which SoC it uses, but since the notebook looks strikingly similar to the N23 Yoga Chromebook quietly launched earlier this year, it is logical to assume that the two computers use the same processor, the MediaTek MT8173C (also found inside the Acer R13). The MT8173 has two ARM Cortex-A72, two ARM Cortex-A53 general-purpose cores, an LPDDR3 memory controller as well as the PowerVR GX6250 (2 clusters) GPU. The chip was originally released in Q1 2015 and today it can be considered as an entry-level solution, something you expect from a sub-$300 computer. As for other hardware, the Lenovo Flex 11 is equipped with 4 GB of LPDDR3 memory, 32 GB of eMMC storage (it is possible that higher-end model(s) will include more NAND flash), an 802.11ac Wi-Fi module (no word on Bluetooth, but technically the MT8173 supports it) and a 720p webcam. The laptop also features a USB Type-C port for data and charging, a USB 3.0 header, an HDMI output, an SD card reader as well as a TRRS audio connector for headphones and mic. Lenovo’s Flex 11 Chromebook will hit the shelves later this month and its entry-level configuration will retail for $279. Lenovo did not say when exactly Android apps are coming to the Flex 11, so if you need them, wait till the Chromebook actually gets an appropriate update.